In this guide we will share how we discovered Early Retirement, and a step-by-step plan to achieve early retirement in India. As a bonus we will also share our own early retirement journey with you. By the end of this guide you will fully understand what Early Retirement is and how can you achieve it. How I Discovered Early Retirement? GRADUATED INTO RECESSION- I graduated in computer science straight into a recession caused by the double whammy of the dot-com bust and the 9/11 attacks. My father had recently retired from his public sector job and I did not have any job offer on hand as campus hiring dried up completely. It felt like I was being tossed around by economic forces beyond my control. JOB WAS FRUSTRATING: When I finally entered the workforce at a Big Company, I was soon frustrated by the usual job stress and job insecurity. WORKING ON EARLY RETIREMENT RELIGIOUSLY: Soon after that we got married and both My wife and I joined hands to pursue Early Retirement. Together we spent countless hours to understand if Early retirement is possible in India. It has now become a way of life for us. This guide is a result of hours and years of brainstorming of how one can achieve financial freedom and retire early in India. Most of the Early Retirement literature online is from the U.S which is understandable because they have a longer history of regulated stock markets & mutual funds compared to India. In this guide we’ll do our best to translate Early Retirement for Indian conditions as we have our cultural differences when it comes to money. We pay for our child’s college, we live in joint families where we also take care of our raging parents. At age between 30-50 when you are able to meet all your living expenses through returns from investments like Real Estate (rental income), Mutual Funds, Stocks (dividends) etc. Also known as passive income. So you don’t have to actively work anymore to meet your expenses. You live on investment returns post-inflation so your corpus will last forever beating inflation…theoretically. In reality people understand that if you retire early at age 30 or 40, you have 50-60 years to live after retirement. So, to be safe and not bore to death :-)Early retirees develop a skill or hobby that they enjoy and which brings some cashflow to supplement their Retirement corpus. Disclaimer : This article is purely the author’s personal opinion. The author is not a certified financial planner. Seek the help of a certified financial planner for your individual situation. Without further digressing let us get back to the business. If you have read up until here then you are really looking forward to Early retirement in India. We will tell you exactly what you need to know. Keep reading. When everyone works till age 60, how can someone retire at age 30 or 40? Math is simple. Invest a large enough Early Retirement Corpus in assets such as Equity, Debt and others which give you average annual returns of anywhere between 9-10% before inflation. Assuming inflation at 6%, you are left with-3-4% returns after inflation to live on. How Big Should Be Your Retirement Corpus? Take your annual expenses at the time of Early retirement and multiply it to any number between 25-50 to derive at your retirement corpus. In ER community 25 Times your annual expenses is the minimum amount of corpus recommended to call yourself an Early Retiree. Read our blog post How much money you need to Retire Early in India which will help you to decide on your retirement corpus. We are targeting 25X as a starting target but will be most comfortable hanging our boots fully when we reach 40X. However, we may take sabbatical or travel the world once we reach 25X. Check out our Semi-F.I.R.E lifestyle in Goa. You have spent a decade or two saving up for your early retirement. Now how to be sure if you have saved-up enough or not? “Safe Withdrawal Rate” answers this particular dilemma: How much can you spend in Early Retirement based on your savings. In our blog post How long will your money last in Early Retirement we introduce our reader to a concept called “safe Withdrawal Rate” (SWR). SWR is a conservative estimate of how much you can safely withdraw annually from your nest egg without exhausting it completely before you die. SWR approach balances between you having enough money every year to live comfortably after early retirement without depleting your corpus prematurely. Person retired with 25X corpus of 3 crore, based on Rs.12 lakhs annual expense. 2% Real Rate of return*- 3 crore lasted for 34 years. 3% Real Rate of return- 3 crore lasted for 42 years. 4% Real Rate of return- 3 crore lasted for 64 years. For detailed experiment visit our blog post How long will your money last in Early Retirement. *The inflation adjusted returns is called as “Real Rate of Returns”. The biggest difference between Traditional Retirement and Early retirement is Time. If you aspire for Early retirement you have less time to accumulate your retirement corpus or Nest Egg and many more years to live on that nest egg. 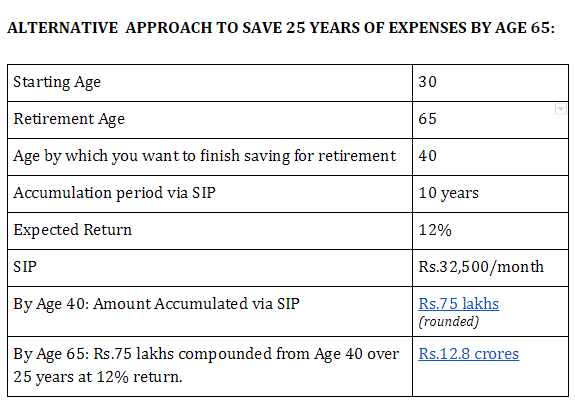 That is the reason most Early retirees save aggressively at least 50% of their income early on in their life instead of doing a small monthly SIP with the goal of retiring in old age at 65. 50% savings rate reduces the time to retire. This is the simple idea behind Early Retirement before inflation & investment returns even enter the picture. This is the only thing under your control so tackle this first. Analyse your lifestyle using apps like Spendee to cut down wasteful spending without being “penny wise and pound foolish”. For example: In our house we use the internet for entertainment so no T.V or cable expenses, we mainly eat home-cooked food so our eating-out expenses are low, we do yoga at home so no gym fees, we own high-quality phones & laptops that are expensive but we maintain them carefully for years so they work out cheaper in the long run. It took us almost 3 years to systematically reduce our spending without feeling deprived. Take a moment to think what are the top 3 categories where you could get the same value but for way less money? If you’ve cut all wasteful expenses and are still not saving enough then your only option is to increase your income. Your early retirement goal gives you the clarity and urgency to do what is necessary to get that promotion or better-paying job. It will not happen overnight but you can work towards it purposefully now that you have a time-bound reason. Early retirement is about creating passive income in future. Debt does just opposite. it eats into your future cashflows. So, debt is an enemy for Early retiree. Till the time you crush your debt you can not become financially independent or achieve Early retirement. Another reason is debt is expensive. For example: Say you have a 36% annual interest Credit Card and an outstanding balance of Rs.1 lakh on it. If you don’t pay back the debt for 2 years then the credit card balance will double to Rs.2 lakhs. If you’ve bought a house on exorbitant EMI at an early age, you need to first crush your EMI. If you have education loan, learn how to crush education loan. What are you planning to do with 2000+ hours that will free up once you quit your job? Plan a /part-time/seasonal side-hustle generating cash to cover your expenses partly/ fully after you retire early. This will reduce your worry if any regarding safety of your retirement corpus plus keep your mind healthy and entertained. In our blog post Want to Retire Early to Travel the World? we share few ideas of creating side hustle/passive income. A couple can have different money habits, but they have to agree on their financial goals to be successful. Get your spouse/partner on board and work together as a team. Read our blog post on how to get your partner on board with your early retirement goals. If all you want is a couple of years freedom to try your hand at a new career or business, try a mini-retirement like we did instead. If you are debt-free and your spouse’s income can take care of expenses, one of you can quit your job with the safety net of your spouse’s income. If you succeed in your venture and are able to cover expenses then your spouse too can quit their job to follow their dreams. This way both of you can make money doing what you like. Even if you fail in your venture, you can re-join the workforce & try again later. Real-life case study: Headline news about all the 45-year old mid-level managers at TCS/Cognizant/Infosys getting laid off because their industry considers them obsolete and who probably won’t get another job at the same salary for atleast another 3-4 years. An emergency fund of just 6-months to 1 year will not help in this case. These folks have been forced to take early retirement. Companies won’t think twice before hiring a younger person with a lower pay check to replace higher-cost employees. SO if you are not absolutely indispensable, ER should be your back up plan. If you are not ambitious to achieve it at age 30, age 45-50 makes a convincing case. Freedom, Courage and Peace – Life keeps throwing curveballs at us, huge retirement corpus at young age is like a massive safety net you can fall back on when things go south. Practise for full retirement- Scaling down your work by 50% by age 40 is a great way to get a preview of what “full retirement” will look like at age 65. You will get a lot of wake-up calls mostly around the state of your health, investment returns , wasteful expenses and whether you really have any true passions in life or were you just lying to yourself about “dreams & passions” to mentally escape from job stress 😉 So while planning for Early Retirement also work on your passion on the side to prepare yourself for the post-40 life. But Let’s be honest, Early Retirement is not for everyone. some people love their jobs and they want to continue working till possible. In that case, you can at-least strive for financial Freedom. In year 2014, we took a calculated risk to quit our jobs and start own business. At that point we had zero debt, owned an apartment and 7 years worth of expenses saved up. Fast forward into present- our business is a success. Business income fully covers our expenses and savings rate is climbing slowly towards 50%. We realised if with 7-years worth of savings we can create such a fulfilling life. 25 times savings will take us to an epic level of freedom and security. That is how we got glued to F.I.R.E. After achieving Early retirement Naren may take up a job at a non-profit at a much lower salary .Sugandha is working on her own and wish to continue doing it. We live somewhat a frugal lifestyle. Check out our current lifestyle here. So what do you think? Can you also do it? or do you need some more motivation? Please check out success stories of Two Middle Class Indian Families who are very close to achieving Early retirement. If they can do it, we can do it so can you. FAQ 1: What about saving for my child’s college expenses if I’m saving first for my early retirement ? We have shared our strategy here- Our Plan to Fund Kid’s College and Recommendation. FAQ 2 : Should I buy house first or save for early retirement? We recommend from personal experience: Don’t buy a house on EMI at a young age in your 20s or 30s when you don’t know where you’ll settle down permanently. We move to other cities and even countries for work these days and there is no knowing ahead of time where you will settle down in old age. Instead save SIP in mutual funds towards buying a house until you have 100% clarity closer to retirement in your 50s or 60s and then build or buy a brand new house or flat fully in cash without EMI. A couple we know are doing exactly this: after traveling all over the world for work & renting throughout they are now building a house in their hometown for retirement in their mid-fifties. FAQ 3: But we want to do extended travel frequently. That’s why we want to retire early and stop working! Think win-win: Once you achieve financial independence you can quit your job and travel for say a year. After a year of travel, you can recharge both yourself and your bank accounts by returning to the job market for a couple of years to work on something you enjoy (maybe something related to travel!). Then travel again. Repeat the process until your 60s by which time hopefully you would have traveled everywhere you wanted to and your compounded retirement fund will be waiting for you! Ask us any questions or just drop us a hello!!! Subscribe by E-mail for more awesome information on Early retirement. We publish one new post every week!!! Its Free! Next article12% return from stock market every year? Hello, a different question! how is life in goa for early retirement? are you guys in north/south goa? suburbs/urban area? we are in US for last 16 yrs, originally from delhi, thinking of retiring in goa/beach town at least part time, thanks! -We currently live in Urban area, it has all amenities you expect in tier 1 city in India- supermarket, shopping mall, movie theater/multiplex, good school, restaurants, hospitals, good doctors. However Goa does not give you as many options as a metro city. -Goa is green, has very less pollution or traffic problems.Overall pace of life is quieter and slow. -It is also safe compared to other cities in India. Overall Crime is low, but drugs is a big menace in tourist areas, it is also impacting local youth as it is readily available to them. So, that is one issue we see you have to be careful about if you have kid/s of impressionable age. -It has good air connectivity to most of India and the world. -Has Plenty of beaches, party places, and vibrant environment. -Offers something for every age- Goa has year around cultural and music events, it hosts international film festival and serendipity art festival and many more such events through out the year. – Any kind of domestic help or service like plumbing/electrician, home delivery of groceries etc are not prompt. Because of various reasons it is always been a challenge to get stuff done here in Goa compared to big city where all these services are only phone call away. -Internet is tricky, some areas get better signal than others. We maintain internet from 4 different vendors at all times. But after JIO things have improved. -Barring few urban pockets, Goa is still a village so finding like minded people can be tricky. -Unpredictable infrastructure- roads are good in most part of Goa, electricity is also not a problem but something as basic as garbage collection does not exist in Goa. In urban areas we have garbage collection but villages/suburbs have make shift arrangement which breaks down now and then. -Also, home delivery for milk, newspaper and stuff does not exist. -Goa beaches are deteriorating- the water quality is going down. -Now and then politically fueled propaganda about “outsiders- anyone not originally from Goa” destroying the state comes up in the media. You can also hear locals being concerned about tourists or outsiders who moved to Goa destroying their state. Overall cost of living in Goa is not that cheap anymore. Rents, groceries, fruits & veggies, maids in urban areas are comparable to other cities. If you move away from cities, real estate may be cheap but you do not get all the amenities. We do not plan to settle down in Goa forever. We recommend anyone who wants to move to Goa to test the waters by living here for 1-2 years before making a long-term commitment. Goa has it is share of perks and challenges. twelve percent CAGR for 30 years . lol. didnt read the article further. Even warren buffet wont get that with my money. 1. The 12% return I assumed in my early retirement blog post was based on a 20-year average of the Sensex from 1996-2016 and not the “year-over-year” return. Stock market returns go up and down sometimes wildly. See my blog post explaining this in detail. 1. Someone already mentioned this but you need to account for amount saved as of now and this needs to grow separately at the same rate as the rest of the portfolio. For eg. if you have saved Rs. 50 lakhs, your target amount to be saved is Rs. 5 crores and you wish to retire in 15 years, then you need to compound Rs. 50 lakhs for 15 years as well and reduce the resulting figure from the Rs. 5 crore target. 2. Corpus needed calculation is a bit basic and your amount is too high as it does not account for any increase in the portfolio post-retirement, which is not the case. I can send you a slightly tweeked version of your Excel that corrects for the above changes, let me know if you are interested. Now we have simplified the calculator further and it is available online so you do not need to even download it. Check it out! 1. Yes you are spot on! if you already have money saved up, you can use the approach you have mentioned. 2. We are planning to do another blog post on our assumptions on how to live off the retirement corpus post retirement. Which will explain post retirement inflation, post retirement return and withdrawls. However, it may take a while for us to publish it. Since what we share is created by us for our own use, take it as a guideline and feel free to tweak it for your need and feel free to share it with the community here. Very good blog, most of us want to retire early guess this is because of the stress in jobs as compared to previous generations. One question is the SIP you mention in blogs is the SIP of mutual funds or some thing else. Will investing only mutual funds give such a big corpus without risk ? Risk is present in every investment. There is Risk in investing even in supposedly “safe” PPF also because the interest rate might not beat inflation in the future. The real definition of risk like Warren Buffett says is the risk that you will not meet your goals. So best is to assess your risk level first and consult a financial advisor to invest based on your goals and risk level. Really a great article. Came to this from an article in TOI today. I’m in the same bandwagon and investing 50% of my earnings targeting retirement at 38. The aim is to work on my interests and completely quit the rat race. Subscribing for more updates. Super! That’s the spirit! Best of luck in the journey Chandan & Stuti. My goal for people reading the blog is to retire in their 30s itself. We only found early retirement in our 30s… otherwise we would have tried to retire in our 30s itself :). My one tip for you folks: It may seem daunting at first when you are just beginning to save a large corpus but compounding makes your job easier in the later years and you’ll achieve your target faster than you thought! How much corpus have you set for yourself at 45? I know this number could be different for everyone depending on their individual lifestyle. But just wanted to know if you have any specific figure in mind and if you’d like to share. Yes we are working with a specific number for retirement corpus. You are right,it will be different for every person. So, We do not see the need to share it on this community. We encourage everyone to find out that number basis individual needs, that way the goal is more realistic and achievable. 2. 12% continuous return not possible at all, I invested in one good fund in 2007 and return not coming 8% because of 2009 banking catastrophe. Time of investment is really important. Well then education expenses and children wedding expenses takes away all your saving in midway so between 40 to 60 you have to take out some money. Thanks for the comment Chanchal. 1. Only government jobs have a mandatory retirement age of 60. Otherwise you set your own final retirement age based on whether you feel like working past 60. Look at all the Chartered Accountants & Lawyers past age 60 who work only during tax season or do easy work like registering a will or sale deed etc. 2. I never say anywhere that 12% return is continuous. I keep saying that 12% return assumption is “CAGR” – compound annual growth rate. Regarding Children’s education & wedding expenses why would you dip into your retirement corpus to fund those expenses? You will still be working even part-time from age 40 till age 60/65 even after saving up for early retirement. That’s the whole point of the article. First you become financially free so you don’t have to stress about losing your job etc allowing you to focus on other important goals without worry. I thank you very much for this beautiful post… it impacted my decisions and changed my way of thinking …. Small confirmation: So for monthly expenses of 50K per month would need 75 Lakhs accumulated corpus. am I right? so that we can retire early? Happy to hear you found it useful Sai! People who value personal freedom appreciate the concept of building a backup quickly. For expenses of Rs.50K per month using the details from your image link, you need to accumulate about Rs.67 lakhs via SIP. You can use our interactive online calculator here : https://savinghabit.com/early-retirement-calculator/ to input your exact details and get a more accurate result. Remember that once you accumulate the corpus via SIP, you cannot stop working and live off the corpus. You need to let the corpus compound till the retirement age as explained in the article. I recommend reading the article again to understand how retiring early means finishing saving up for retirement early so you can focus on more important goals in life using the huge corpus as a safety net. Hi, this is a very good article highly relevant in today’s times. One thing which I feel is still missing in the excel sheet is the consideration of the amount(wealth) which is already saved for retirement. For example the need to do SIP is coming basis the requirement however if portion is already invested for retirement how will that get adjusted? I think you can simply subtract your saved-up corpus from the “Early Retirement Principal you need to Accumulate via SIP” to get the adjusted SIP.